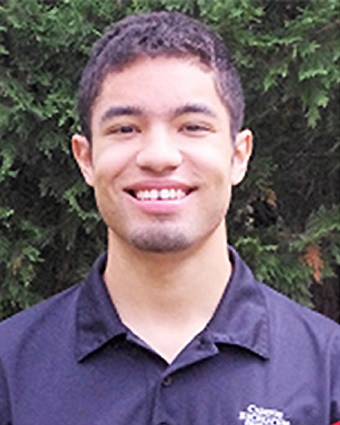 We chatted with Alan - who will graduate in May, 2018 - to learn more about his experience in the Materials Science and Engineering undergrad program, and to find out why he chose the University of Maryland for his studies. My primary reason for choosing UMD was because of the incredible STEM advances in the Clark School of Engineering. Whether it’s transparent wood, a human-powered helicopter, or a house that runs solely on solar power, the Clark School has amazing students that pioneer exciting projects, and I wanted to become one of these students. Also, the Clark School’s reputation is ever-increasing in the country and in the world. All in all, UMD worked best for me in terms of distance from my family, amount of school spirit, and engineering rigor. I first learned about MSE at Maryland Day 2012. I was in my sophomore year of high school, and I knew I wanted to pursue engineering, but wasn’t sure which specialization. A few weeks after that Maryland Day, I remember watching a NOVA video about graphene and its potential applications. I instantly fell in love with graphene and material science. I knew I wanted to join the graphene research efforts (since then, I have changed my focus to transparent wood). What’s awesome about MSE is that it is the backbone for a lot of science and engineering disciplines. A degree in MSE allows you to work for a lot of different companies, so it’s nice to have that flexibility. I currently conduct on-campus research in Professor Hu’s group, with a focus on fabricating transparent wood. It’s a very exciting topic, because transparent wood aims to replace glass as an energy-efficient window material. I’ve been working in the group since February 2017. I’m currently the leader of one of the MSE Capstone research teams, which plans to improve upon the design of transparent wood windows created by other researchers in the Clark School. Our project aims to create a hybrid transparent wood window which finds a compromise between visibility and efficient light scattering. In addition to working with Professor Hu, I spent 3 weeks during my freshman year winter term (January 2015) in Professor Phaneuf’s research group. I assisted post-doc Amy Marquardt with developing atomic layer coatings to protect museum artifacts. First of all, research is amazing because it strengthened my network. I’ve never been in contact with so many people who have been published in my field. Furthermore, my research has enriched my undergraduate experience because it’s given me a hands-on experience which allows me to apply what I’ve learned in lecture. I’m currently applying to graduate school, and having research on my resume will definitely affect my chances of acceptance. I plan on pursuing a Master’s of Science in Materials Science, so having undergraduate research experience will prepare me for the graduate thesis research I’ll (hopefully) be undertaking very soon. My favorite class is ENMA312 (Experimental Methods in Materials Science) because it was the perfect blend of professional report writing, hands-on experiments, and lecture. A lot of the skills learned in that course have directly applied to my research. For example, ENMA312 taught me how to measure thermal conductivity, which is a property frequently measured in transparent wood. I’ve enjoyed all of my materials classes, though. The professors are so knowledgeable and passionate about the various topics, and I’ve learned so much from each class. The best piece of advice I would give to another student thinking of majoring in MSE is to be true to yourself. That is, if you don’t like the major you choose, switch to one you actually enjoy! I have several close friends who hesitated to switch majors until their junior year, and regretted not doing it earlier. So if you take ENMA180 and ENMA300 and realize it’s more frustrating than interesting, definitely consider switching to another major (you’ll thank yourself later). The university provides a ton of help for those switching majors to make the change not as frightening. If you do end up choosing MSE (because it’s something you have a passion for), know that you’ll have an amazing network of MSE alums to contact, so take advantage of that. You’ll also have access to an awesome lounge, old homeworks/exams for MSE classes, and a fun community full of MSE undergraduates like you (MatES)! So don’t hesitate to reach out to them either; they’re going to help you a ton throughout the four years. Finally, if you’re looking into doing research, don’t hesitate to contact professors about joining their research groups! Most usually have a vacancy or two. Working for a professor is a great thing to add to your resume and it’s a great way to get that lab experience you’ll need in the future. I tutor undergraduate students in math and science, mentor freshman in the Honors College, go salsa dancing on the weekends, watch an occasional Maryland sports game, and hang out with friends. I will be pursuing a Master’s degree in Material Science, then hopefully starting my own company related to transparent wood.